Tom, 86, passed away peacefully in Enon, Ohio surrounded by his loving family on Thursday, May 24, 2018. Tom was born on August 1, 1931 in Kinston, North Carolina. He was the son of John Curtis and Mamie Dawson Phillips. He had three sisters, Frances Coltrane (Irvin), Laura Goodwin (Walter), Charlotte Acker (Jim), and two brothers, Robert Lee (Frances), and John (Carol). He was the beloved husband and companion to his wife of 62 years, Sumiko (Kawasaki); devoted father of Nelda Burd (James), Judith Campbell (Richard), Tom Pete Phillips, Jr. (Karen), Barbara Phillips, and Christa Horn (Dave); loving grandfather to 11 grandchildren; and proud great-grandfather to 11great-grandchildren; as well as numerous other extended family. A funeral service will be held on Wednesday May 30, 2018 at 3:00 P.M. at the Byron Church, 3230 Trebein Rd., Fairborn, Pastor H. Wesley Barnhill officiating. The family will receive friends from 1:30 P.M. until the time of service at the church. Burial with military honors will follow at the Byron Cemetery. Arrangements in care of Belton-Stroup Funeral Home, Fairborn. 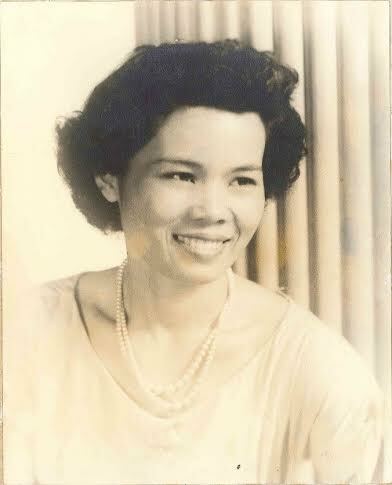 Kayoko was born on July 12, 1935 on Tinian Island which is part of the Commonwealth of the Northern Mariana Islands. She passed away on Friday, May 15, 2015. 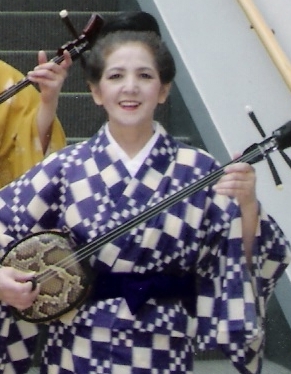 Kayoko was a resident of Anderson, Ohio at the time of her passing. She is survived by her husband Charles. A celebration of her life will take place on her birthday July 12, 2015 at 2 PM at Woodland Mound Park. Kayoko was active with the Okinawa Tomono Kai of Ohio. She did line dances with her friends from Cincinnati. Kayoko danced at the 2014 Spring Celebration. 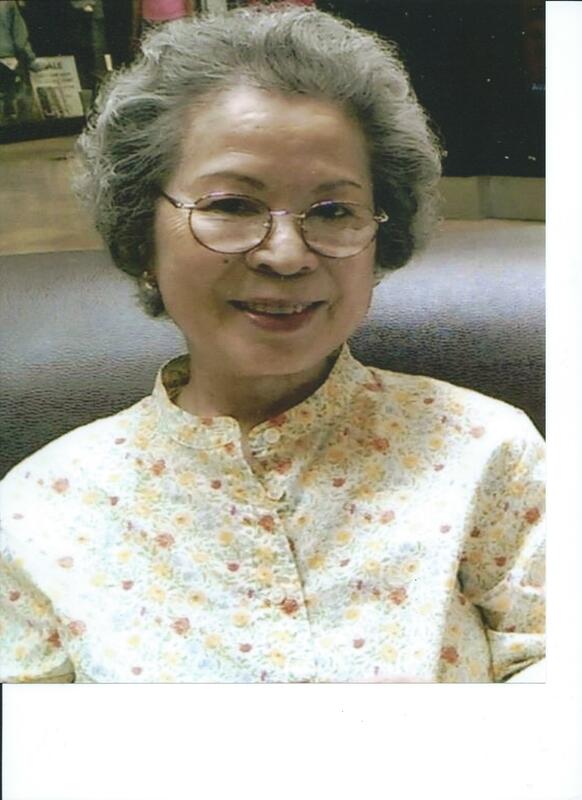 Kayoko bright, cheerful and was a loving mother and grandmother. She frequently visited her children in Florida. Sumiko Kawasaki Phillips 84, passed away peacefully at her home in Enon, Ohio, surrounded by her loving family, on Monday, January 26, 2015. Sumiko was born on December 10, 1930, in Okinawa, Japan. She was the daughter of Saburo Itokazu and Yasu Kawasaki (Itokazu). She had two brothers, Seigo Kawasaki (Akiko) and Mitsuo Kawasaki, and two sisters, Setsuko Tokuyama (Seitoku) and Fujiko Kyan (Hideo). She was the beloved wife, companion, and friend to her husband of 62 years, Tom Pete Phillips; devoted mother of Nelda Phillips Burd (James), Judith Phillips Campbell (Richard), Tom Pete Phillips, Jr. (Karen), Barbara Phillips (Derek Ernest), and Christa Phillips Czyzak; loving grandmother to Desere’ (George), Jennifer (Jon), Christopher, Nicholas (Sheena), Drew, Ryan (Michelle), Joshua, Alyssa, and Colin; and proud great-grandmother of Ellie, Makenzie, Makayla, George, Alexander, Charlotte, Isabelle, and Everett. She also leaves behind numerous cousins, nieces, and nephews. She was preceded in death by her parents, brother Seigo, and sister Setsuko. 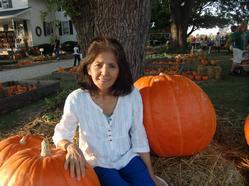 Sumiko was a kind, loving, and generous soul. She always looked for the good in people and served as an inspiration and positive role model for her family and friends. She was a member of Byron Church and the Ladies Guild, enjoyed participating in the Okinawa Tomonokai of Ohio, and loved to bowl in the Kittyhawk Military Wives Bowling League. She especially cherished her many friends from Okinawa and Japan. 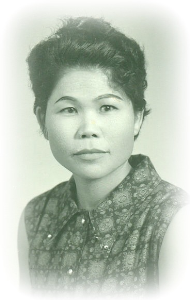 Sumiko was a loving and hardworking mother to her five children as they lived in Okinawa, North Carolina, Montana, Texas, New York, and Ohio during her husband’s service in the Air Force. She was an accomplished seamstress and cook, and loved playing piano, gardening and ikebana (Japanese flower arranging). She loved to share flowers, fruits and vegetables with friends and family from her beautiful gardens, and she never missed an opportunity to see a grandchild’s sporting event, play, or recital. A devoted and loving wife, mother, grandmother, daughter, sister and aunt, Sumiko leaves a legacy of love to family, friends and all who knew her. Friends will be received at Belton-Stroup Funeral Home, 422 E. Dayton-Yellow Springs Rd., Fairborn, from 5:00 until 7:00 P.M. on Wednesday January 28, 2015. A funeral service will be held on Thursday January 29, 2015 at 10:30 A.M. at Byron Church, 3230 Trebein Rd., Fairborn, Pastor H. Wesley Barnhill officiating. Burial will follow in the Byron Cemetery. The family extends a heartfelt thank you to Shirley Ernest for her loving support and care for Sumiko during her hospice care. Memorial contributions, if desired, may be made to the American Cancer Society . Condolences may be made to the family at http://www.BeltonStroup.com. 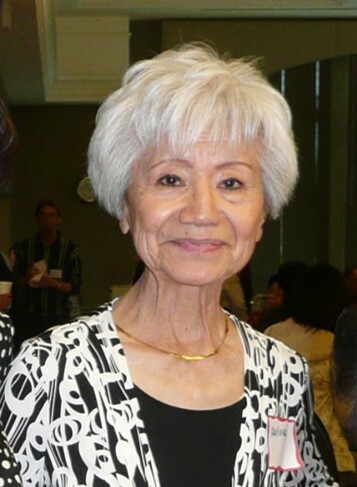 Ume “Fumiko” Miller, passed away at Good Samaritan Hospital on Saturday, November 30, 2013. She was born in Okinawa, Japan to the late Kamasuke and Kamato Kakazu. She is preceded in death by her 5 brothers and 2 sisters. Ume loved to garden and sew. She loved spending time with her friends, and singing karaoke. She was a friend to everyone she met, and generous with all. Fumiko is survived by her loving husband of 49 years, Bob Miller; daughter, Barbara Miller and sister, Toyo Miyagi. A gathering of friends will be held 12:00 Noon-1:00 PM, Thursday, December 12, 2013 at Newcomer Funeral Home, 3380 Dayton-Xenia Road, Beavercreek, OH 45432. A memorial service will be held at 1:00 PM, also at the funeral home. If desired, memorial contributions may be directed to American Cancer Society. 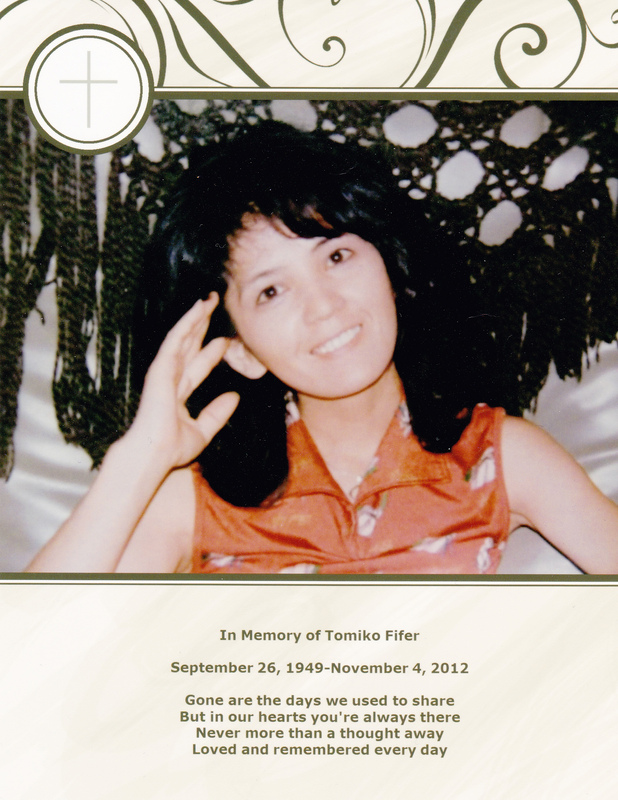 Tomiko Fifer, 63, passed away peacefully on November 4, 2012, at Heartland Hospice of Waterville surrounded by family and friends. She was born September 26, 1949 in Okinawa to Chishin and Hatsu Shimabukuro. After coming to United States, she continued to be involved in her Japanese Culture by playing music, singing, dancing, making origami and cooking food. She loved flowers especially dahlias and would have plants all around the house and a garden in the summer. She loved playing with her grandkids and spoiling them. She worked as a seamstress at Superior Uniform, and worked at S & K Menswear until it closed in 2009. She is survived by her children, daughter Michelle(David) Cousino; son, Edward Fifer; 2 Granddaughters; McKenzie and Camryn Cousino; 6 sisters; Hiroko Kanna, Eiko Azuma, Reiko(Munetake) Ooshiro, Machiko (Masaru)Arakaki, Yoshiko Shimabukuro, Naoko(Shigeo) Arakaki; 1 brother, Chiichiro Shimabukuro and many nieces and nephews. She was preceded in death by her parents and 2 brother in laws; Torao Kanna, Kenshin Azuma. A heartfelt thank you to her dear friend Inge Floering. And a special thank you to St Charles ICU and CCU, DaVita Dialysis, Regency Hospital, Heartland of Waterville, Heartland Hospice of Waterville, and her many Dr’s for all the loving care she received. In lieu of flowers, memorials may be made directly to the family.